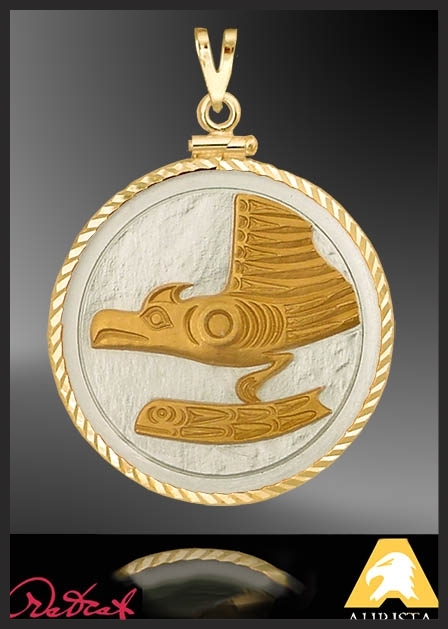 This Salish Northwestern Native American style pendant features a custom medallion highlighted in 24KT gold and pure silver and utilizing the breathtaking traditional Salish themed art of renowned artist Joseph Paul Illg. Reversible pendant including "Eagle & Salmon" on one side and "Weaving Woman" on the reverse. Diamond cut frame is Sterling Silver with a generous layer of pure gold. 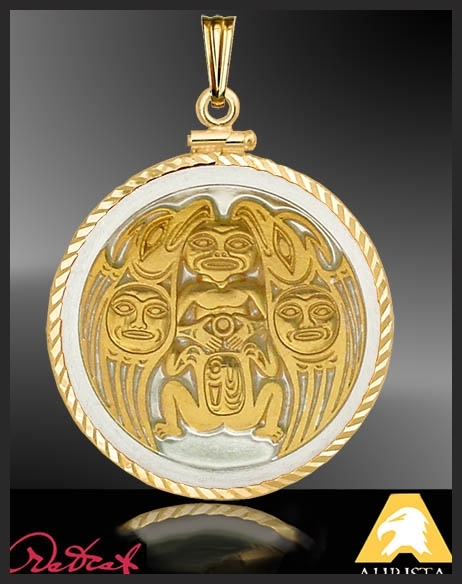 This Salish Northwestern Native American style pendant features a custom medallion highlighted in 24KT gold and pure silver and utilizing the breathtaking traditional Salish themed art of renowned artist Joseph Paul Illg. Reversible pendant including "Eagle & Salmon" on one side and "Weaving Woman" on the reverse. Diamond cut frame is Sterling Silver with a generous layer of pure gold. Lifetime warranty against defect, uniquely numbered signet and certificate of authenticity.